Zach and I have been playing a lot of tennis lately. Well, we’ve been playing a lot of Wii tennis. When it’s this hot outside, it’s just a lot easier to play video game tennis than it is to spend hours outside in the sun. We’ve actually become a pretty good doubles team. Ok, not really. Zach is pretty good and he lets me play on his side because otherwise he would beat me pretty much every single game. During one of our recent games, he asked me, “Why do they call it “love”? At first I thought “Man, that’s a pretty deep question for a 10 year old. Especially to come up with in the middle of a game of Wii tennis.” But then I realized that he was talking about Wii tennis, how in tennis the score is always 15-love or 30-love or 40-love. What he was asking me was why do they call it love instead of zero. It was a good question and I had absolutely no idea what the answer was. So I looked it up on the internet. While all tennis scoring is baffling, the most perplexing element is the use of “love” when a player hasn’t scored any points. Though one theory claims the term is a corruption of the French l’oeuf (“the egg”) to describe the shape of the number zero, the Oxford English Dictionary suggests that love really does mean “love.” The only thing keeping a scoreless player on the court is the love of the game. In tennis, love isn’t all you need, but it might be all you’ve got. What I learned was that in tennis, love isn’t all you need, but it might be all you’ve got. This phrase kept coming to mind as I wrestled with what Paul was saying to the Galatians. Some weeks, I get to dance with the Scriptures, when everything comes together in a graceful rhythm. Other weeks, it is definitely a wrestling match. One where I want to go one way but the Scriptures keep pulling me in another. This passage is always a wrestling match. Much like I Corinthians 13, what Paul writes in Galatians 5 is one of those passages that suffers from familiarity. These two, among many others, are so familiar, so well loved and frequently used, that their impact gets lost. We read them (or hear them) and we think we already know all there is to know about them. We can recite “love is patient, love is kind…” and list the fruit of the Spirit: love, joy, peace, patience, kindness, generosity, faithfulness, gentleness, and self-control without even thinking about what we are saying. In doing so, we lose what they mean. We miss what they are saying about love. Unlike tennis, where love isn’t all you need but it might be all you’ve got, what Paul is saying that love IS all you need; love for your neighbors and love for yourself. And this love is enough. It’s that simple. And that difficult. It’s easy to say “love is all you need” or “love your neighbor as yourself” but it’s so much harder to do it. More truthfully, we MAKE it so much harder. We make it hard to love our neighbors as ourselves because we either don’t love ourselves at all, which renders us incapable of loving others, or we love ourselves too much, which leaves us no reason to love others. This is what Paul means when he writes about gratifying the desires of the flesh rather than living by the Spirit. When we don’t love ourselves, we try to find that love in the wrong places. We try to fill that void by doing things that, at least at first, feel good but ultimately lead to those “sins” of the flesh: fornication, impurity, licentiousness, idolatry, sorcery, enmities, strife, jealousy, anger, quarrels, dissensions, factions, envy, drunkenness, carousing, and things like these. The same is true when we love ourselves too much. When we love ourselves too much, we have no thought or concern for others. All of our actions are about ourselves, about gratifying and filling OUR needs and desires. This leads to the same results as not loving ourselves at all: fornication, impurity, licentiousness, idolatry, sorcery, enmities, strife, jealousy, anger, quarrels, dissensions, factions, envy, drunkenness, carousing, and things like these. When we don’t love ourselves or when we love ourselves too much, this is when we “bite and devour one another.” We get so caught up and consumed with what we need and want that we forget about what others need, about what others want. Either we forget about them or we just don’t care about them. Either way, we are not loving them. And it shows. Maybe not in such extremes as fornication, impurity, licentiousness, idolatry, sorcery, or even in drunkenness or carousing. But it shows in strife, jealousy, anger, quarrels, dissensions, factions, and envy. If these are the “works” of your life, then you do not have love. You may want to have love, you may even think that you have love. But you don’t. And it is evident by that which is around you, by that which defines you and your life. If you are surrounded by enmities, strife, jealousy, anger, quarrels, dissensions, factions, envy, and things like these. Then you don’t have love. Not for yourself and not for your neighbor. Love is the fruit of the Spirit not the works of the flesh. It is not unintentional that Paul refers to the works (plural) of the flesh and the fruit (singular) of the Spirit. There is only ONE fruit of the Spirit but there are many works of the flesh. 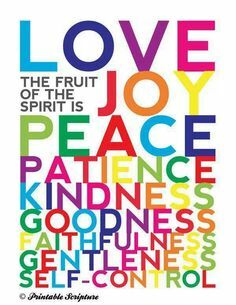 The fruit of the Spirit is love. It is love that leads to joy. It is love that brings peace. It is love that provides patience. It is love that generates kindness. It is love that causes generosity. It is love that inspires faithfulness. It is love that instills gentleness. And it is love that gives self-control. This is what love does because this is what love is. When everything else is gone, when we get down to what we would call the “essentials”, love is indeed all that we have and all that we need. And it is enough. What Paul is telling the Galatians, and telling us, is to look at who we are. He is challenging us to look at what we have, to look at the works that we have , to look at the fruit that we bear, and ask ourselves, are we living by “flesh” or by the Spirit? If we are living by “flesh”, if we are ruled by our own wants and desires, then it is not enough and it will never be enough. If we are living by the Spirit, if we are truly able to love ourselves and our neighbors, then that is enough. Love is all we have and it is all that we need. Brothers and Sisters, let us love one another.